Above All Roofing understands that a quality roof is more than just a new roof covering; it is an interdependent system of components. Each component of a roofing system requires careful attention to quality and installation in order to protect the customer’s investment, as well as manufacturer warranties. Originally used for temporary protection against the elements, the roof underlayment is now a necessary part of your roofing system. The underlayment provides an essential layer of protection on top of the decking to help keep moisture out. It is necessary for your manufacturer’s warranties and to meet building codes. There are a number of underlayment options to choose from. We will assist in helping you choose the best options for your home and budget. Your roof deck provides the foundation for your roofing materials. The decking is sheets of wood (generally OSB or plywood) that are secured to the rafters of your home. In some cases the decking may need to be replaced if its integrity has been compromised, usually due to age and normal wear and tear. There are many reasons this can occur including; inadequate attachment of existing panels, sagging or ridging between supports, soft and wet panels, mold/mildew growth at panels, or delamination. You may be able to identify bad decking by simply walking on it or by looking at the underneath of your decking (if you can see it from your attic). Very often you cannot determine the condition of your decking until your existing roof is removed. Above All Roofing will advise you during the tear-off process as to the condition of your decking and what options are available. 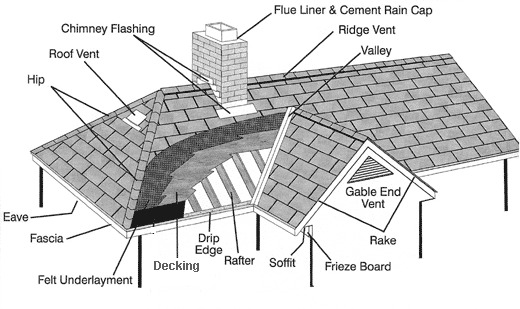 Add extra protection in valleys and at eave and rake edges—the most leak-prone areas of the roof. Extra protection is strongly recommended for chronic problem areas like skylights, dormers, vent pipes, chimneys, and other flashing areas add another layer of protection.